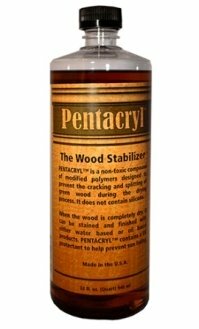 Pentacryl is a wood stabilizer used by woodcarvers, woodturners and furniture makers to keep green wood from cracking, checking and splitting during the drying process. It also speeds the drying process. Pentacryl™ will not discolor the wood, is non-hygroscopic and will not oxidize, decompose or migrate in the wood when exposed to different degrees of temperature and relative humidity. If you enjoy turning or working with green wood but struggle with cracking, checking or warping, you need to take a closer look at Pentacryl! I like to use Pentacryl Wood Stabilizer on my rough-turned green wood. I use it on everything except the Indian Rosewood and Mimosa as these are such stable woods that it's not needed. I use a paint brush to apply Pentacryl to the inside and outside of the item. I don't immerse and soak my item in Pentacryl as the company directions state since it then takes forever to dry. Store it out of sunlight & direct air movement till dry, here in Florida, usually 4-6 weeks. An easy way to test if your item is dry is to try sanding it. If your sandpaper loads up, it's not dry enough. When the rough turned bowls have dried sufficiently, remount on your lathe to complete the final turning, sanding and finishing. Not ready to work with your log yet, but want to prevent it from drying and cracking on the ends? 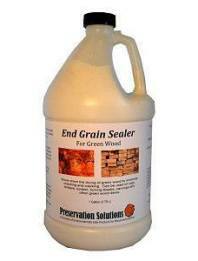 Or you need to slow down the drying on that large piece, try our End Grain Sealer. This a non-toxic wax emulsion that is applied to the end grain of green wood or the face grain of turning blanks or carvings. This product is beneficial when you want to slow down the drying of green wood, since the end grain dries much faster than the rest of the wood. Odie’s Wood Butter is a Food Safe, Solvent free, Non-toxic Wood Finish and Stabilizer that can be used alone or in conjunction with any combination of other Odie’s Oil Finish Products. This high concentration of Odie’s Oil enhances luster and durability in one coat. 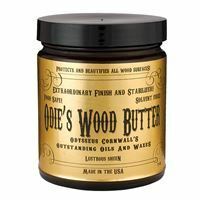 Odie’s Wood Butter (OWB) does not contain driers or any toxic chemicals, and all ingredients are food safe. Formulated to work on even the oiliest of woods, OWB is great for all species of wood, exotic and domestic. Use OWB like a soft wax to increase sheen and protection with the added benefits of oil. Will actually get better with age, becoming more durable and more beautiful! Just like the original Odie's Oil, OWB is great for wood turners and can be used as a friction polish! For extraordinary results, use over original Odie’s Oil. Great finish for new wood and can be used to reactivate old wax. Suitable to use over other finishes to refresh and rejuvenate. It contains natural UV inhibitors-sunscreen for wood! Odie's Wood Butter is easy to use! No sanding or stripping in between coats or for retouching! Wipe on, Wait a while, Buff off. Easy! A LITTLE ODIE’S WOOD BUTTER GOES A LONG WAY! "No solvents" means there is almost nothing to evaporate, so what you put on the wood, stays in the wood. OWB covers many, many times the area of other wood finishes. Up to 20 times the coverage as conventional finishes. Coverage will vary depending on wood density and porosity.